This model is the Glam Toy Products GTP-586 4 Door Sedan Car in light green over dark green Army livery. The model has a one-piece, pressed metal body, 130mm in length, making it larger than the other sedans (103mm). It has been shaped with rudimentary representations of the body lines. There is no glazing - all the features are litho-printed onto the body. 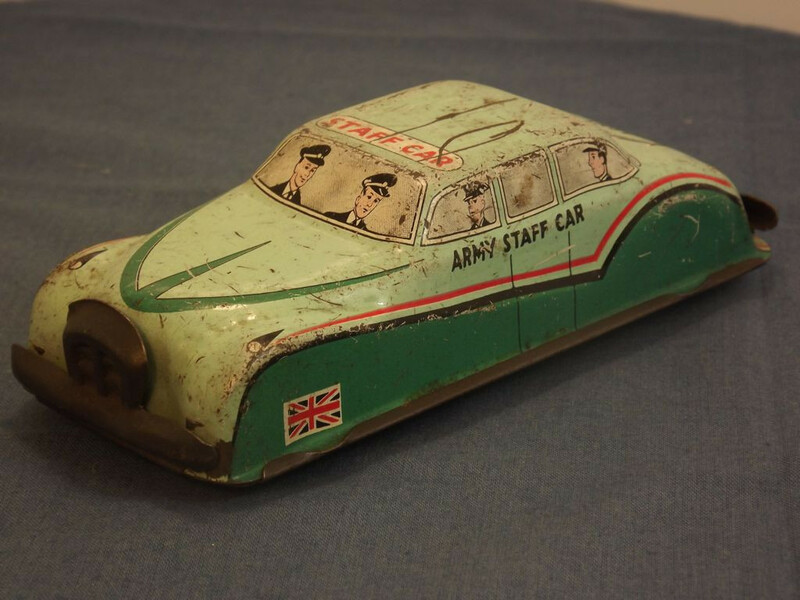 At the front are representations of the windows, driver and front passenger, and side lights, the bonnet is light green and has dark green body trim. 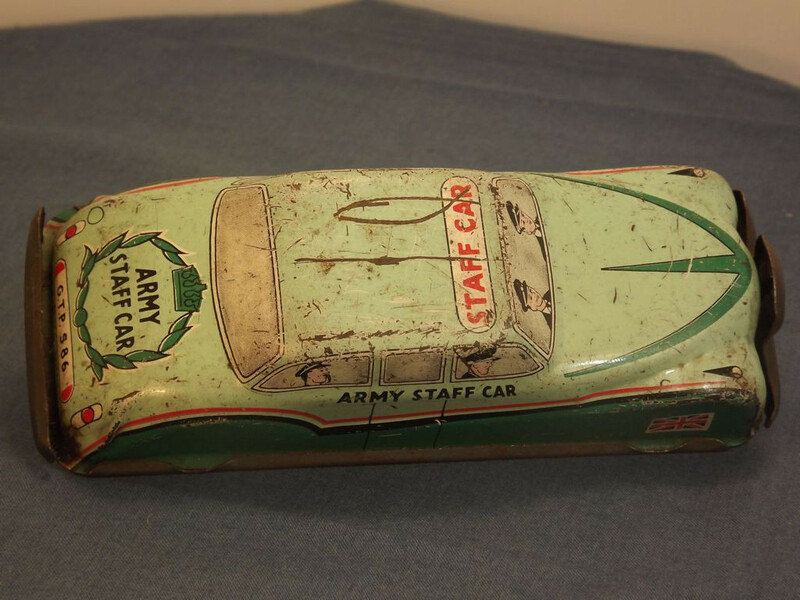 To the sides there are the outlines of the doors across which is "Army Staff Car" in black lettering. 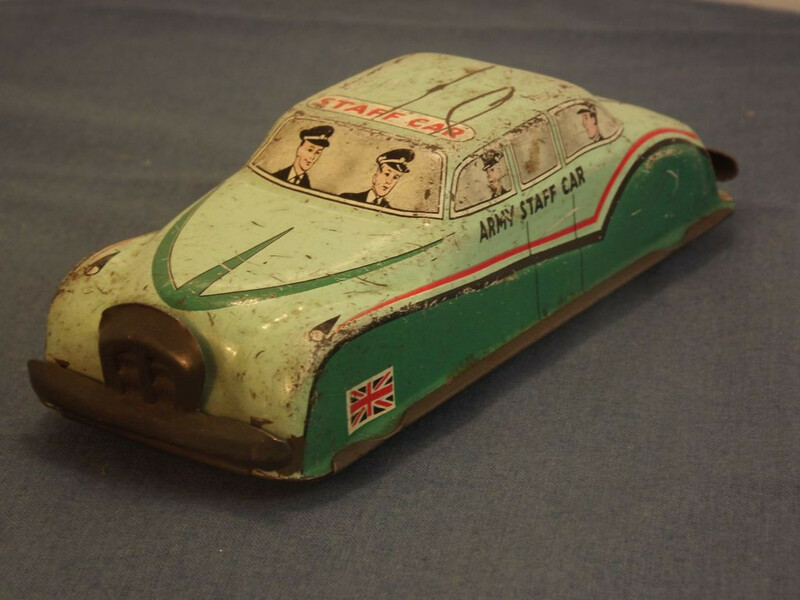 The lower sides are in dark green with separate red and black curved lines representing body trim, and a "Union Jack" flag to the front. The front windscreen and front passenger side windows have the profile of the driver and passenger. The rear passenger side windows have a profile of two further passengers, but there is no representation of these passengers in the rear window. The roof is light green with printed "Staff Car" in red lettering on a white background to the front. The rear does not bear the legend "Made in England" as on other models by this manufacturer, but carries a small "Made in Gt. 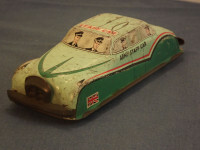 Britain" legend just hidden behind the rear bumper (black lettering on the light green body colour). Above this, also on the boot is the white numberplate with black lettering reading "G.T.P. 586". 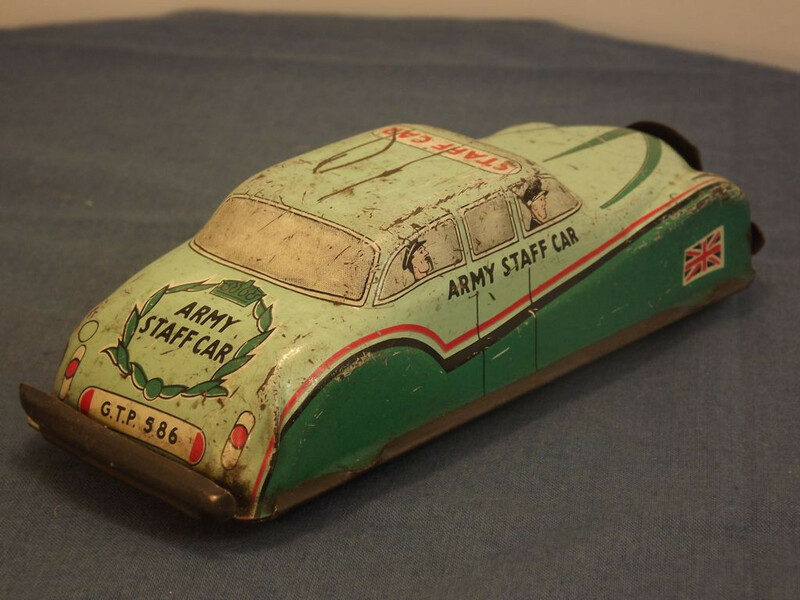 The boot is also emblazened with dark green laurel wreath inside which are the words "Army Staff Car", petrol cap, and rear lights in white and red.